The Parthenon in Athens is the most renowned existing building of ancient classical Greece. 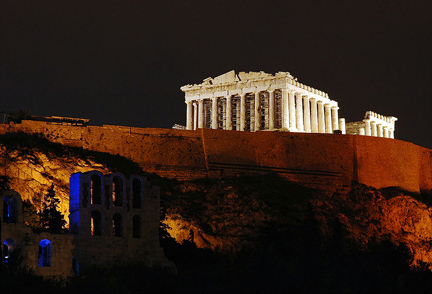 It represents a timeless icon of Ancient Greece and it is one of the world's greatest historical and cultural monuments. In Greek mythology, Athena is the goddess of wisdom. This building is dedicated to the Greek goddess Athena, whom the people of Athens considered their patron goddess for the salvation of Athens and Greece in the Persian Wars. The building was officially called the Temple of Athena the Virgin; the name comes from the Greek word parthenos, "virgin". Today, it is one of the most recognizable icons and popular tourist attractions in the world. Currently selective restoration and reconstruction programs are in progress to ensure the stability of the partially ruined structure. This ancient structure is situated on a hill called Acropolis in Athens, Greece and has stood atop the Acropolis for nearly 2,500 years. Its construction began in 447 BC and the building was significantly completed by 438 BC, but work on the decorations continued until 433 BC. Eventhough this structure was used as a Greek temple, it was used as a treasury of the Delian League. In the 5th century AD, it was converted into a Christian church. After the Ottoman Turk conquest, it was turned into a mosque in the early 1460s, and it had a minaret built in it. This building was constructed at the initiative of Pericles, the leading Athenian politician of the 5th century BC. It replaced an earlier marble temple, begun after the victory at the battle of Marathon at approximately 490 BC and destroyed by the Persians in 480 BC. This temple had replaced the very first one that was built in 570 BC. It was built under the general supervision of the sculptor Phidias, who also had charge of the sculptural decoration. The architects were Iktinos and Kallikrates. The purpose of the building was to house a 40 feet high statue of Athena Parthenos sculpted by Pheidias. Parthenon is regarded as the classic example of the Doric peripteral style with innovative architectural features. It has a rectangular floor plan and there are a series of low steps on every side. The dimensions of the base are 228 feet in length and about 101 feet in width when measured at the top step. It has a colonnade (8 x 17) of Doric columns extending around the outside edge of the entire structure. The Doric columns measure 6.2 feet in diameter and are about 34 ft high. Doric columns are thicker and shorter. The corner columns are slightly larger in diameter. 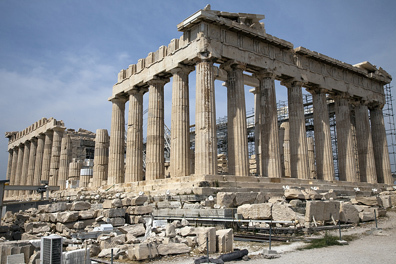 The Parthenon had 46 outer pillars. Each entrance has an additional six columns in front of it. The stylobate is the platform on which the columns stand. It curves upwards slightly for optical reasons. Entasis refers to the slight swelling of the columns as they rise, to counter the optical effect of looking up the temple. The effect of these subtle curves is to make the temple look even more symmetrical than it actually is. Both the base and columns were designed for visual effect. The cella or the inner chamber of the temple was about 97 feet in length and 63 feet in width, with internal colonnades in two tiers, structurally necessary to support the roof. The roof was covered with large overlapping marble tiles known as imbrices and tegulae. There are two interior rooms inside, the larger room , the naos, has the chryselephantine statue of Athena Parthenos. The smaller room, the opisthodomos was in use as a treasury. It is known that Parthenon was partly painted in bright colors though dispute exists regarding the extent and the color system. Close observation and modern scientific analysis have proven that it was in fact originally painted several different hues including blue, gold, and red. The metopes of the temple's Doric columns, all represented various instances of the struggle between the forces of order and justice. On the west side, the mythical battle against the Amazons; on the south, the battle between the Lapiths and the Centaurs; on the east, the battle between the gods and the giants; on the north, the Greeks versus the Trojans. The Parthenon frieze runs around the upper edge of the temple wall. The frieze has a single subject on all four sides. On three sides (north, west, and south) it depicts a the Panathenaic procession, the major annual festival in honor of the goddess Athena. According to some scholars, it depicts a mythical, original procession, while other theories believe that it is the procession which took place in the same period as the temple was built.